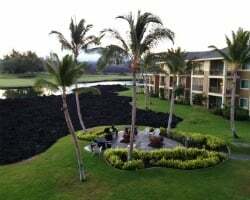 Walk to the breathtaking shores of Waikoloa from your very own private accommodations at the Kings' Land by Hilton Grand Vacations Club resort. Find timeshare resales and rentals priced up to 70% under retail costs with SellMyTimeshareNow.com. What’s My HGVC Timeshare Worth? All the beauty and majesty of the Kohala Coast is yours at the Kings' Land by Hilton Grand Vacations Club resort. Positioned on the spectacular Waikoloa Beach, you'll be front and center among all Hawaii's Big Island has to offer. Spend your days lazing on the beach under that signature Hawaiian sun, or go out and adventure around the towering peak of Mauna Kea. Whether you're seeking an active or a relaxing getaway, the King's Land Hilton resort is the perfect place to do it. The resort consists of a variety of suites ranging in size from one bedroom to three bedrooms, offering guests the maximum flexibility in finding accommodations. Perfect for couples, families, and groups alike, modern in-unit amenities like laundry machines, private balconies, and full kitchens ensure that everyone's stay is comfortable and convenient. With unbeatable views of the resort grounds and the neighboring golf course, you'll know you've arrived in paradise as soon as you check-in. Are you ready to find instant Hawaii vacation solutions? 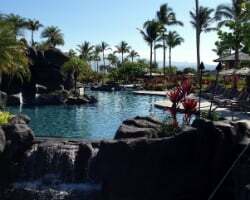 Browse the timeshare resale and rental postings currently available at the Kings' Land Waikoloa resort for great deals on annual accommodations. Fill out the the form on this page to learn more about the resort and its ownership opportunities, or call 1-877-815-4227 today. Buying a timeshare at the Kings' Land resort on the resale market not only provides you with an instant vacation solution, but can make that solution much more affordable. Timeshare resale advertisements are provided by the unit's current owner, not directly by the resort. As such, the prices of timeshare resales are often much more reasonable than retail prices—sometimes even at discounts up to 70%. This allows vacationers like you to save big on outstanding vacation ownership solutions at resorts like the Kings' Land. What's more, timeshare resales at Kings' Land by Hilton Grand Vacations Club often come in the form of deeded weeks, floating weeks, and HGVC points at annual ownership intervals. This allows buyers to find a timeshare that works for their vacation preferences. Additionally, timeshare resales at the resort fall into Hilton's Gold and Platinum seasons, and are eligible for Hilton's rewards program, HHonors. 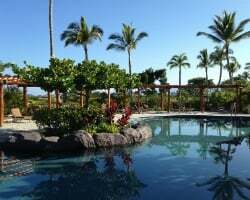 As a Hilton Grand Vacations Club affiliated property, resale buyers at the Kings' Land Hawaii resort will not face many restrictions on their ownership there. While resale buyers can't enroll into the club at the Elite level, they can still make reservations using their deeded week or HGVC points. Points-based owers may also explore internal exchange opportunities to reserve stays at other Hilton resorts around the globe. Kings' Land by Hilton Grand Vacations Club is also affiliated with RCI, the world's largest timeshare exchange company. A separate RCI membership can allow Kings' Land resale owners to use their ownership to trade for stays at other resorts all around the world. Plus, the Kings' Land Hilton is a Gold Crown-rated resort, RCI's highest distinction of quality for their affiliates. This rating will likely work in your favor when exchanging, as it will undoubtedly provide more trading power to unlock more exchange possibilities. The Kings' Land Hilton leaves no stone unturned in providing complete and convenient on-site amenities. From the outdoor swimming pool, to the fully-equipped fitness center, to the on-site golf course, you'll have all your recreation needs met without having to leave the resort's grounds. 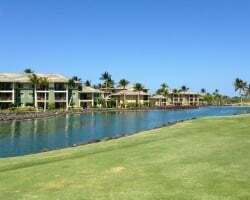 Just beyond the buildings that comprise the resort, you'll find the beautiful Waikoloa Beach. Enjoy classic Hawaiian sunsets right from the beach's golden sands, or snorkel among the occasional sea life that ventures close to shore! When it comes to dining, you'll have no shortage of options. The Kings Land Bistro and Lounge is perfect for meals at all times of the day, while the Kings Land Pool Bar provides poolside cocktails and local cuisine. Nearby, you'll find that the Big Island is built for exploring. Hike jungle trails and discover unique sights like Akala Falls, or visit one of the more maintained attractions like the Hawaii Tropical Botanical Gardens. No visit to the Big Island is complete without making the pilgrimage to Hawai'i Volcanoes National Park, where you can see lava flows and witness the island growing right before your very eyes! Already Own at Kings' Land by Hilton?